There's a lot of talk about self-care out there on the internet these days. It's a concept that seems a little bit skewed in my mind and if I'm being honest, it makes me pretty uncomfortable. It brings to mind trendy things like turmeric lattes and long baths with fancy healing salts and yoga retreats in far away places. It makes me uncomfortable because it makes me think about my own privilege: I am a white woman living in a beautiful, progressive city; I have a full-time job and health insurance; I have an amazing partner and wonderful friends; my family is healthy and safe; I have time to do the things I love. Practically my whole life could be considered a form of self-care and that makes me feel guilty. I feel guilty asking for help when I need it, I feel guilty for taking time off, I feel guilty for sleeping in, I feel guilty for being tired at the end of the day. The list could go on and on, but despite all my guilt and all my privilege, I'm still going to advocate for self-care because it's all hyped up for a reason: being kind to yourself - just like being kind to others - is important. This kindness feels especially relevant during the winter months when the darkness and cold can make some of us lose our inspiration (and maybe our sanity). We need to remember that self-care isn't always easy either - some of us need to close in on ourselves and do those homey, cozy, luxurious things; some of us need to up the intensity and break out of harmful habits or change our behaviors; some of us need to practice finding our edge and doing the things that really scare us. We're all working on something, and the more I sit with this idea, the more come back to something I talk about all the time: balance. Yes, we're all working on something, but in order to be successful with this work, we have to give ourselves time to recover. It's a bit like running a race, I guess. The challenge is the preparation and the running - the waking up early to train through darkness and cold, the physical difficulty of speed or steep hills, the mental heaviness that comes from trying to occupy your mind when your body hurts deeply. The recovery is what comes after the racing and the training - the endorphins, the stretching, the hot shower, the cozy clothes, the delicious breakfast. We need both the work and the reward to truly benefit from the process. Our challenges are likely things we aren't proud of and I'm certainly not brave enough to share all of mine here. But I am working on a lot this winter and I'm embracing the balance of challenge and recovery. Let's try not to be afraid of looking deeply at ourselves, making change, and reveling in our efforts. There isn't quite enough kindness in the world right now, so let's keep on trying to be kind whenever, wherever, and to whomever we can. I've been playing around with these muffins for a while, but I think I've finally found the right balance for the season. 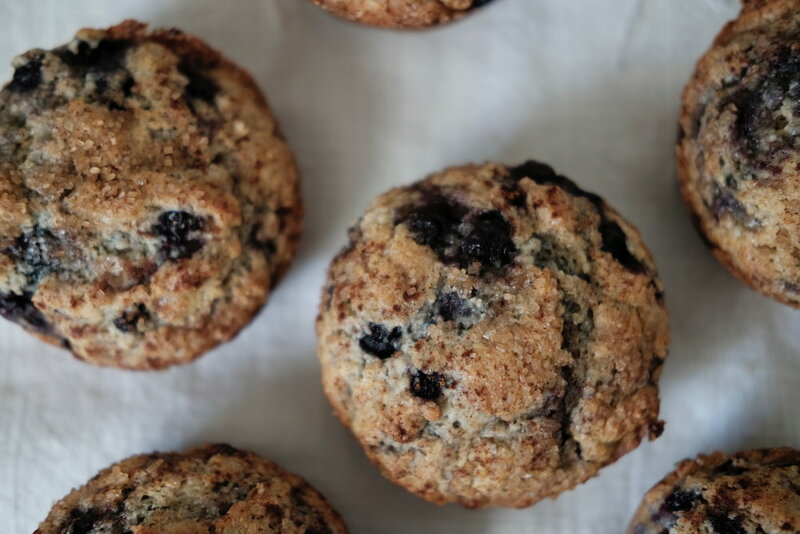 The rye flour and cinnamon feel grounding and wintry, while the blueberries bring just enough of a summery hint to remind me of how much I have to look forward to. If you can help it, don't shy away from the turbinado sugar finish - the crunchy lid adds a great contrast to the soft inside. Preheat the oven to 400 degrees and grease a standard muffin tin with butter. 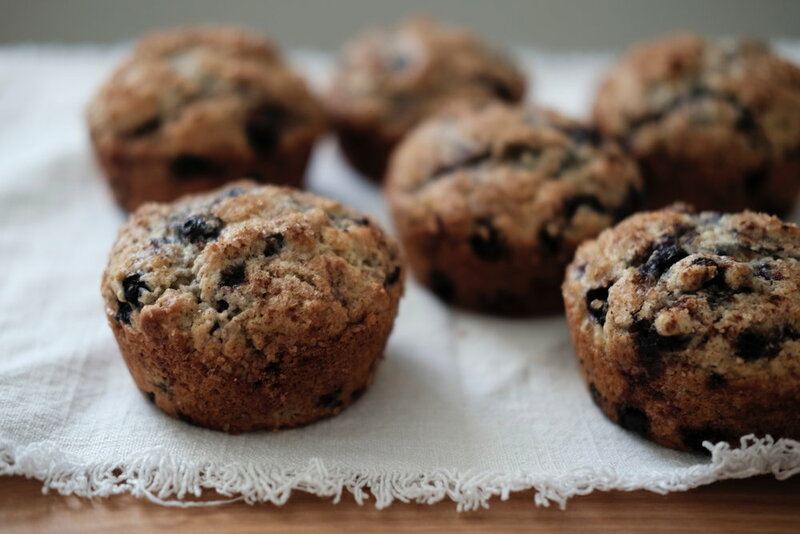 In a small bowl, toss the blueberries in 1 tablespoon of flour and set aside. In a large bowl, mix together the dry ingredients. Make a well in the center and pour in the wet ingredients. Gently stir everything together; when almost combined, fold in the blueberries. 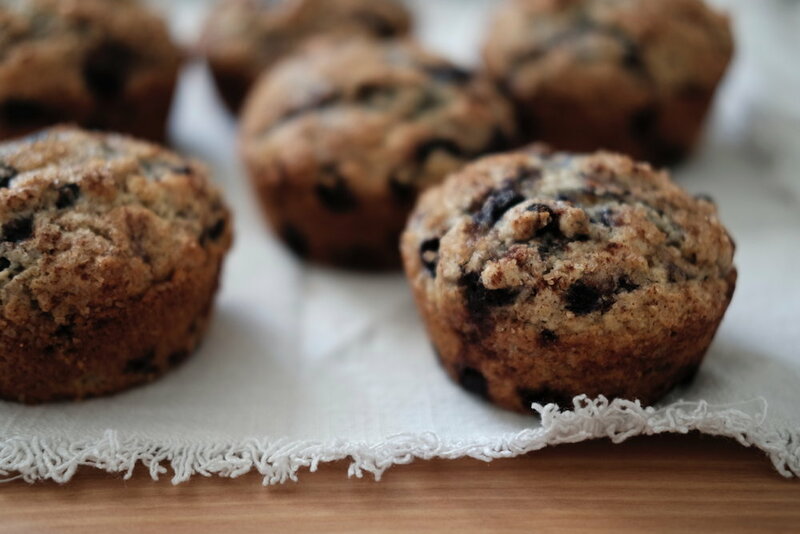 Scoop the batter into the muffin tins and sprinkle the tops with cinnamon and turbinado sugar. Bake for 15 to 20 minutes, until the muffins are golden brown and a knife inserted into the center comes out clean.